Simon Kenton’s football team strolled into Fort Thomas on Friday night under much different circumstances than years past. The Pioneers were 5-0, and had rolled through the first half of the regular season. Meanwhile, Highlands had lost four consecutive games, including two losses by double-digits. Last year, Simon Kenton topped the Bluebirds for the first time since 1974, by a score of 42-3. At the time, it was the Bluebirds' fourth consecutive loss, but also the last game they would lose until the Class 5A state semifinals. Highlands led the all-time series 25-2 coming into Friday. After three hours of play, 1,383 total yards of total offense, and 18 touchdowns, Simon Kenton knocked off the reeling Bluebirds for the second year in a row, this time by a final score of 77-53. According to KHSAA records, the 740 yards of total offense Simon Kenton amassed Friday is tied for the ninth-most by any team in state history. Highlands’ 643 yards of offense just missed the top 25. Both teams’ offenses erupted out of the gate, breaking off huge chunks of yards, both on the ground and through the air, and trading punches like the game was a world-class tennis match. Highlands struck first on a 62-yard run by senior running back Jared Pulsfort. 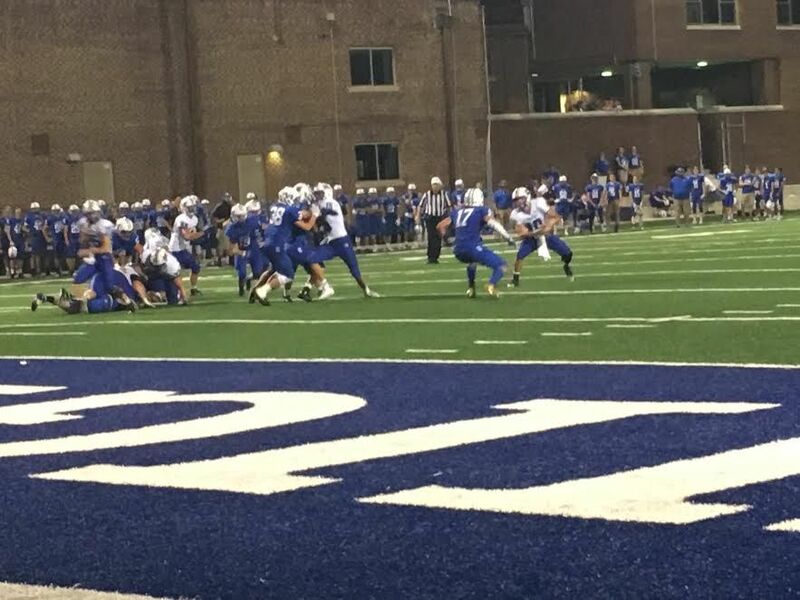 Simon Kenton responded with a 10-yard rush by senior quarterback Cameron Racke. Then Highlands’ junior receiver Nick Veneman hauled in a 58-yard score. Then Racke threw for a 10-yard touchdown. The Bluebirds again broke off a series of big plays on their next drive, capped off by quarterback Brady Gosney punching it in from the goal line. Then senior receiver Luke Vance burned Highlands’ secondary for a 50-yard score. Then Veneman scored again, this time from 68 yards out. Then, mercifully, the first quarter ended. When the dust finally settled, Highlands held a 27-21 lead, and fans of both teams were left nursing severe cases of whiplash. On Simon Kenton’s next possession, the Bluebirds netted the game’s first defensive stop when senior Dalton Cornett tackled the ball carrier for a loss on fourth down. After another deep pass completion and a facemask penalty, senior running back Grant Murray scored from 2 yards out to give Highlands a 13-point lead with eight minutes left in the half. Three plays later, when a Highlands defensive back lost his footing, Luke Vance again found wide open spaces to notch his second touchdown of more than 50 yards on the game. The Bluebirds’ offense answered yet again, gobbling up 60 more yards and seven more points, capped off by Veneman’s sliding touchdown catch on third down-and-nine. Veneman finished the game with a team-high 140 receiving yards on four catches and three touchdowns. After Racke scrambled for a five-yard touchdown to narrow the margin to six points, Simon Kenton finally netted its first defensive stop of the game, forcing Highlands to punt with two minutes left in the first half. This time Racke found junior receiver Sam Murray for a 47-yard touchdown pass to give the Pioneers a 42-41 heading into halftime. Murray finished the game with 5 receptions for 165 yards and 2 touchdowns. The Pioneers’ offense continued to move the ball at will in the second half, while its defense worked out some of its coverage blunders that plagued the first 24 minutes of action. Just 14 seconds into the second half, Murray again zipped past the opposing secondary for a touchdown to give Simon Kenton an eight-point lead. Highlands effectively moved the ball throughout the half, but allowed touchdowns on 11 out of 14 defensive stands for the game. They would never draw within one score again. Simon Kenton outscored the Bluebirds 14-6 in the second quarter behind another rushing touchdowns by Murray and Racke, and 21-6 in the fourth behind receiving touchdowns by Vance and Timmy Cottrell and a rushing touchdown by junior quarterback Matt Shearer. Both teams’ quarterbacks scrambled to avoid sacks and remained calm under pressure to find receivers downfield. Highlands’ Gosney completed 30 passes for 402 yards and 4 touchdowns. The night belonged to Racke, however, who passed for 336 yards and 6 touchdowns, rushed for 134 yards and 3 touchdowns, and hauled in a 44-yard reception for good measure. Simon Kenton’s sophomore kicker, Christian Seger, also converted all 11 PAT attempts, becoming just the 11th player in KHSAA history to convert at least that many in a single game. Seger doubles as the leading goal-scorer on the Pioneers’ soccer team. “That guy has a lot of confidence in what he’s doing and our guys believe in him. He makes it to every practice that he can, and always works hard. He was nails tonight. I said, jokingly, that he may wind up being our leading scorer on the season, because we spread the ball around so much,” said Marksberry. With the win, Simon Kenton improves to 6-0 on the season. After a bye week, the Pioneers host Boone County on October 7. Highlands drops to 1-5 with the loss. The Bluebirds travel to Edgewood to take on Dixie Heights in two weeks after a bye next Friday. 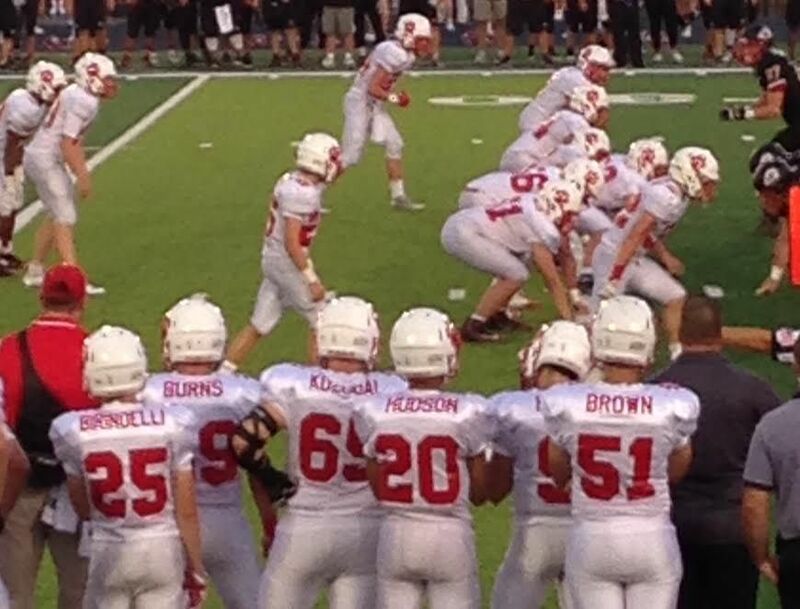 Beechwood rolled past Holy Cross 55-21 last season. When senior fullback Riley Burns found the end zone from a few yards out to put his team up 7-0 early against the Indians, this game had a bit of last years’ feel. Only, this version turned out vastly different. To end the first quarter, Holy Cross junior quarterback Dylan Couch found junior Bryce Melcher for a 25-yard score, as the Indians’ receiver kept one foot in bounds in the left corner of the end zone despite good coverage by the Tigers’ cornerback. The extra point failed and Beechwood led 7-6. On fourth down near midfield and three minutes into the second, the Tigers’ struck back. Courtesy of a perfect pass from junior Brayden Burch to senior Aiden Justice over the middle, the visitors took back the lead, 13-7. On its ensuing drive, Holy Cross dodged a bullet as Indians’ return man Perry Thomas fumbled and turned the ball over back to Beechwood. However, when the Tigers’ fourth down try failed, Indian standout senior running back Derrick Barnes took a handoff several plays later 66 yards for a touchdown and a 13-13 score. Beechwood then followed with two big plays of its own to go back on top. Justice gained over 50 of his 100-plus yards rushing on the night, on the Tigers’ initial play from scrimmage with a run down the right side. Junior James Davis finished the quick drive for Beechwood, finding the end zone for a 19-13 lead. Taking advantage of another Holy Cross turnover on its next possession, Burch found Justice for 20-yard score and a 27-13 lead following a successful two-point conversion to senior Garrett Ratliff. But, in keeping with the game’s theme, the Indians’ countered with Barnes again finding the end zone on a run of 80-plus yards, closing the gap, 27-19. To cap a high-scoring first half, sophomore running back Logan Castleman found the end zone for Beechwood and a 34-19 halftime lead for the Tigers. On its initial drive of the third quarter, the Tigers’ fake punt near midfield was stopped short by the Indians, who took advantage, courtesy of a 35-yard run by senior Xavier Abernathy. Beechwood’s lead was cut to eight, 34-26, remaining that way through the rest of the quarter. Justice found the end zone again for his third touchdown of the evening to wrap up the scoring for the Tigers. Up 40-26 with over eight minutes still to go in the final quarter, Beechwood’s defense bent but did not break. Bouncing back from an earlier possession in which a kickoff return for touchdown was called back due to holding, Holy Cross’ Barnes again outran Tigers’ defenders to the end zone, 45 yards to bring his team closer, 40-33, with 2:12 remaining. However, when Beechwood recovered the Indians’ onside kick, it ran out the clock and converted a key first down to seal the victory. Indian duo Abernathy and Barnes finished the game with 344 yards rushing between them, while Justice totaled over 100 yards rushing and receiving for the Tigers. Beechwood (4-1) stays on the road to face Newport next week, while Holy Cross (3-2) travels to face Bethlehem. Mason Co. 21, Scott 15. The Eagles could not pull off the win in Taylor Mill on Friday and lost a hard-fought district match-up. The Eagles drop to 1-6 and visit Harrison County next week. Dixie 23, Boone Co. 12. The streak continues as Boone Co. suffered its 26th consecutive loss. Dixie snapped a two-game skid to improve to 3-2 on the year. The Colonels host Cooper next week. The Rebels of Boone Co. (0-6) will have their hands full with a trip to Independence to face Simon Kenton. Walton-Verona 36, Carroll Co. 0. The Bearcats went down to Carrollton on Friday night and had the run of the place, improving to 3-3 on the season. Walton hits the road again next week when it faces Owen Co.
Garrard Co. 26, Lloyd 25. Heartbreaker for the Juggernauts who fall to 3-2 after their trip south. Lloyd is on the road next week when it faces Conner in Hebron. Harrison Co. 30, Holmes 6. The Bulldogs had their homecoming spoiled, too, and not just because it had to play its home games in Erlanger while its field is being renovated. Holmes's record falls to 2-4 and the Bulldogs will have a week off before hosting Bourbon Co. on October 7.
Cooper 38, Lexington Catholic 20. The Jaguars bounced back from last week's thrashing by Simon Kenton for a solid win in Lexington. Cooper improves to 4-2 and goes to Dixie next week. Nicholas Co. 35, Bishop Brossart 25. The Mustangs split their two-game road trip and fall to 3-2 on the season. Brossart hosts Ludlow next week. Campbell Co. 48, Western Brown (OH) 21. The Camels ended a two-game skid with a big win on the road. Campbell Co. is now 3-3 on the season and after a week off will host Conner on October 7. Williamsburg 29, Ludlow 12. It was a long trip to the Kentucky-Tennessee border for the Ludlow Panthers, and probably a longer drive back after the loss. The Panthers are now 2-3 and travel to Alexandria next week for a date with Brossart. St. Francis DeSales (OH) 49, Covington Catholic 17. The Colonels were roughed up handily during their trip to Columbus. 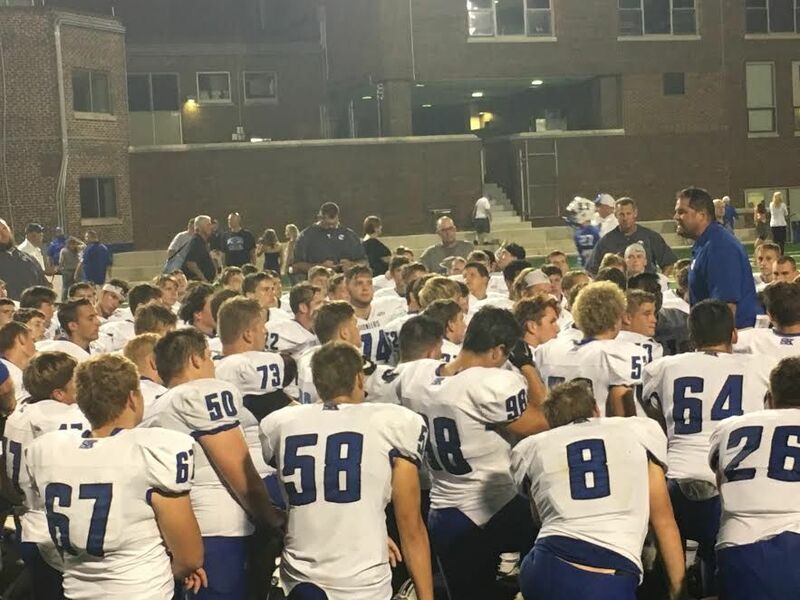 Cov Cath saw its 4-game winning streak snapped and its record fall to 4-2 on the year. The Colonels have next week off before traveling to Grant Co. on October 7. -Alex Valentine in Ft. Thomas, Jason Finnell in Park Hills, Brian Frey in Dayton, Bellevue, and Newport, and Michael Monks in Covington.